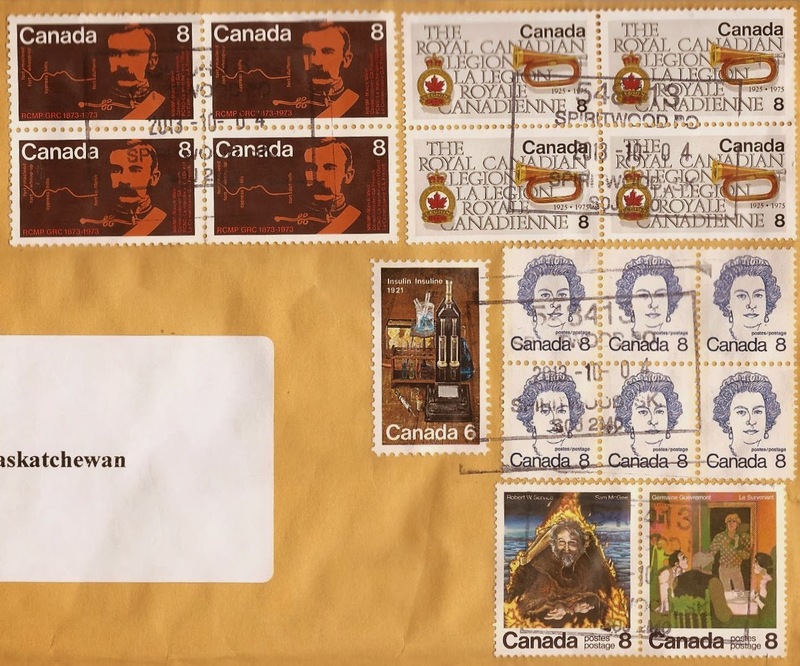 Do you look at the stamps on the letters and parcels you receive in the mail? 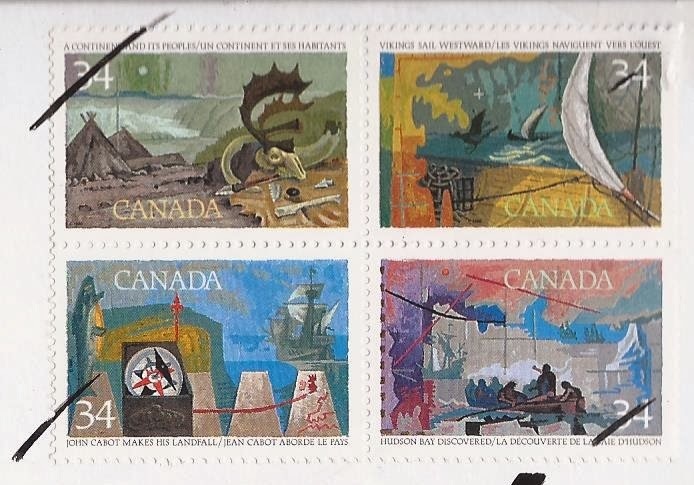 I am not a stamp collector, but I find myself drawn to the beautiful artwork involved in postage stamps with their different themes that cover every type of life on earth as well as most historical events. At an early age, I learned to collect used stamps and bring them to the church where they were added to a large jar. I didn't know what they would be used for, and I never asked. It was just something you did much like adding your dime in the offering plate. On one of my downtown forays to Winnipeg's Hudson Bay Company store I happened to end up on the 5th floor in the coin and stamp corner and a small white gunny-sack looking bag caught my eye. I eased open the strings that held it closed and found it chock-full of used postage stamps - stamps that looked like the ones I'd been cutting off envelopes and giving to the church. I brought the bag to the man behind the counter and told him they looked like the kind I'd been bringing to church. He explained that it was one way local churches raised money for missions - by selling the collected stamps to the dealers. And then he went one step further and explained the correct way to cut off a stamp so a stamp collector would appreciate it more. 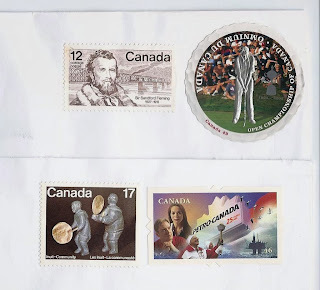 In the following image, these 3 stamps could be worth more to a collector because they include the cancellation stamps - the rubber stamped image that covers both the stamp and the envelope. The cancellation stamp details the origin and date and therefore contains historical information to enhance the stamp itself. 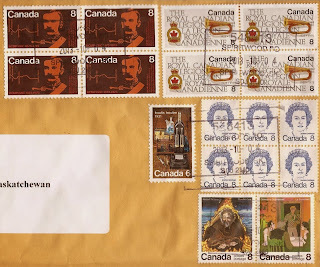 But lately, I've noticed a change in both the Canadian and American postal systems. 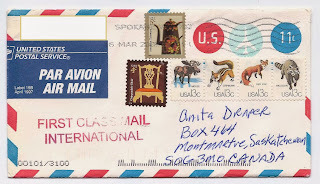 Take a look at the following air mail envelope which I feel is a keeper for its beauty alone. 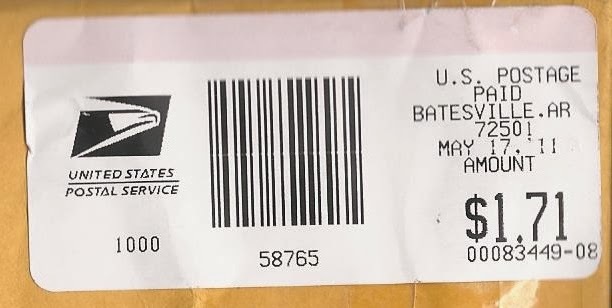 Other than the return address which I've blocked out, do you see anything strange? 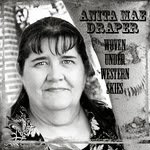 If you look close, you'll see that the top stamp - the one with the coffee pot - was cancelled in Spokane. But the others weren't cancelled at all. What does this mean? Well to me, it means a free stamp that I can re-use. Not that I'd do it, though because that would ruin this historical artifact. 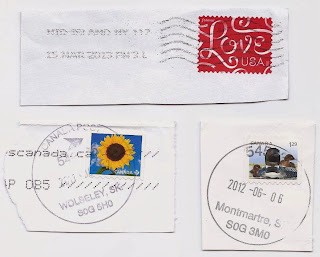 The following image shows only the corner of 2 envelopes among several that I've received from the same person - and none of them have ever had cancellation stamps. How does that happen? 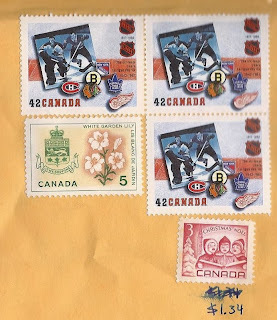 The bubble envelope below wasn't from the same person that sent the above envelopes, and yet none of these postage stamps are cancelled either. Then I received this next envelope. 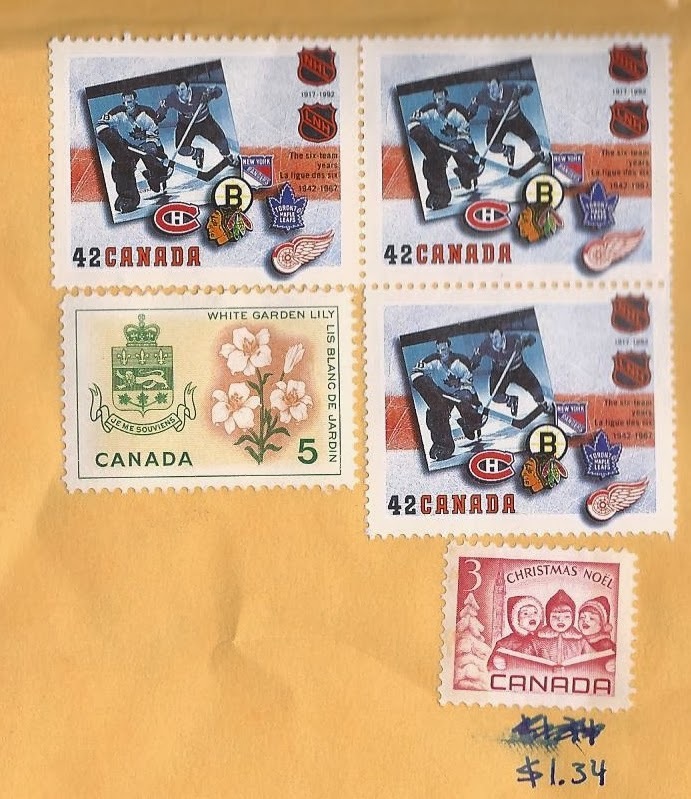 None of the stamps are cancelled, but 3 of them have a black mark streaking across one corner. I suppose this is to stop anyone re-using the stamp, but those marks ruin it for an experienced stamp collector. 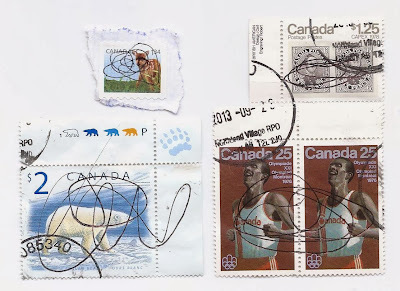 And then horrors, I started receiving envelopes with stamps that had been scribbled on, as if a toddler had gotten a hold of them and tried to draw a picture. 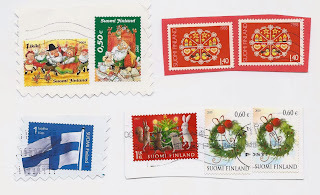 Before I decided to write this post, I threw out several envelopes that contained many gorgeous stamps with pen scribbles on them. The image below is only a small portion of the stamps I've noticed with this characteristic, and some of these have even been properly cancelled. To me, marking and scribbling on postage stamps is akin to vandalism. When I first spotted this trend, I thought it originated from Canada Post's privatization of postal outlets where the private postal workers were cutting costs by not buying the rubber cancellation stamps. But is the same thing happening in the United States? And it's not just North America. 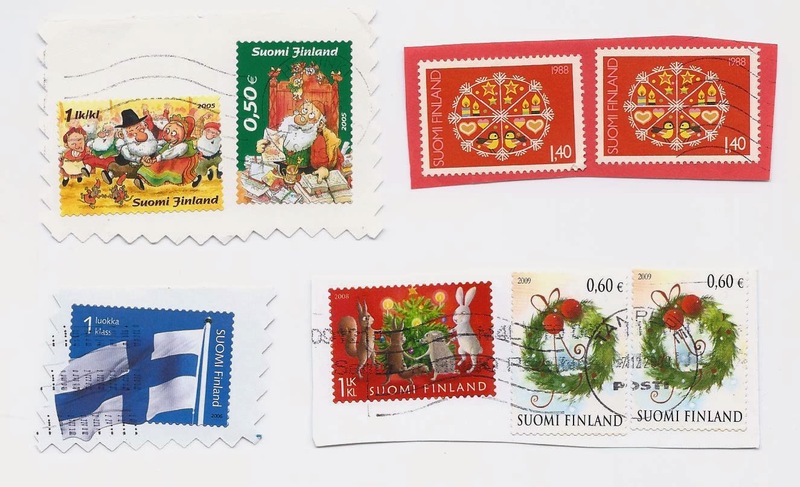 The following four groupings were taken from envelopes from Finland. The top left and bottom right were properly cancelled. The bottom left is acceptable. In the top right grouping, however, only the right side is cancelled. At least the left side isn't scribbled out. Can anyone tell me what type it is? 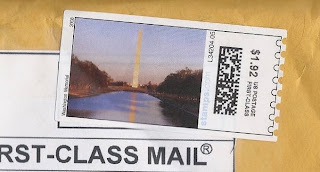 Is it the next generation of electronic stamps? And if it is the next generation of postage stamps, I wonder if it's something I should be collecting for hubby. What are your thoughts? Do you notice the stamps on your mail? Do you know what's happening in the industry? We'd love to hear your thoughts on this. My Grandma had a stamp collection. I liked looking at it upon occasion mostly because there were stamps from all over the world in there, and I would imagine all those exotic places. I think my mom has the collection now. Not sure. The scribbling is strange. Seems like it would take more time. I know, eh. Which is what got me to thinking about the lack of a proper rubber stamp. As for the postie who cancelled the stamps and then scribbled as well, the thought came that he might be a disgruntled stamp collector. Oooh, I love stamps. I used to keep a lot of stamps, but I'm in no way a collector. However, I like to buy interesting stamps. It's so much more fun to use stamps of flowers or Disney characters or authors! I've seen a few scribbles to cancel stamps, too, and I don't like it. It's ugly and yes, it does seem like it would take more time. Thank you, Susie. I was beginning to wonder if maybe I was the sole recipient of all the icky ones. Not glad it's happening in other locales, but glad it's not just me if you know what I mean. Yes, it's boring to see those printed out fake stamps. I recall the fun of buying a variety of stamps to get to 1.34 for instance. WHen I was at the PO this weekend I was so tempted to buy stamps just for the fun of it (DUH that's the point of stamp collecting) I could so easily start. I do have a few special sheets but I appreciate the chance to buy and send a few with some kind of 'point' to them rather than just postage. I just saw the Emancipation Proclamation stamps. I would have the Austen "money" in hand now if my debit card had allowed me to purchase. apparently my bank had some kind of alarm on this kind of online spending. (Good I supposed) because I bought Austen money to collect it and the sale wouldn't go through. How cool your collections of canceled stamps. 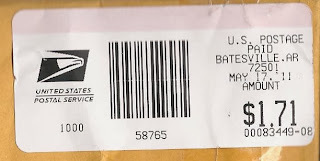 I think my biggest surprise is how much postage has gone up in the US over the last 20 yrs... when we buy the 'forever stamps' (they don't show prices) we tend to forget how much one little stamp is. yikes! I'd be a stamp collector but I can't pronounce it. Yeah, I hear you on the pronouncing of Philatelist. Now if it were a numismatist, I can do that one since I am one. And I don't mind talking about coins at all. They have Austen money?